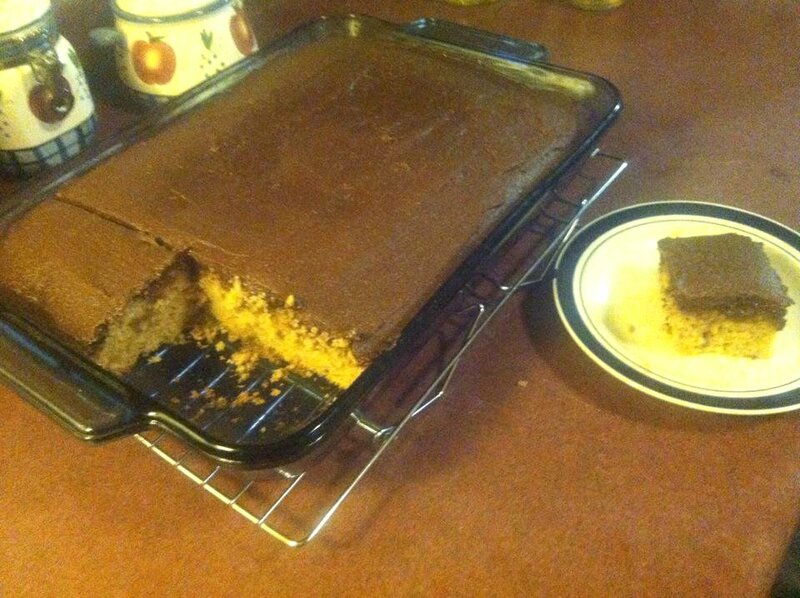 Being Brinckhaus: Yellow Cake w/ Chocolate Tofu Frosting!! Yellow Cake w/ Chocolate Tofu Frosting!! Cakes often equal celebrations: birthdays, weddings, graduations, baby showers, and the list goes on. For those who try to avoid animal products, cakes can prove a bit of a challenge. There are some bakeries now that make vegan cakes, but these can prove to be quite pricey. So what are you to do when a cake-worthy occasion looms and you don’t want to break your pocketbook? Make one! My sister Karina, the “professional” baker of the family, has made many scrumptious, beautiful, AND VEGAN cakes, including a wedding cake! While I have much less experience in making vegan cakes than she does, I do occasionally try my hand at it. So, here is my most recent creation. It is a delicious yellow cake with chocolate frosting. You should definitely give this one a try! Preheat oven to 350°F. Coat a 9 x 13-inch pan with some oil, or a non-stick cooking spray. Soften coconut oil in a small pan over low heat if it is not warm enough for the oil to be liquid at room temperature. Place oil in a bowl and cream with sugar and vanilla. In a separate bowl, mix flour, baking powder, and salt until well combined. Add flour mixture and non-dairy milk alternately to the oil/sugar mixture and mix until all is evenly incorporated. Pour mixture into prepared pan and bake for 30-35 minutes or until toothpick inserted in center comes out clean. Let cake cool completely before frosting. Tip: Make frosting first so it can begin to set in the refrigerator while cake is baking. Melt chocolate chips in a double boiler or microwave. Place tofu in food processor and whip until smooth, scraping down sides several times. Add sugar and vanilla and process. Pour melted chocolate chips into tofu mixture and blend completely. Variation: If you don´t own a food processor, I just used my handheld electric beater to first beat tofu until fairly smooth, and then added the sugar and vanilla (mix powdered sugar into tofu a bit before turning on the beater so sugar doesn´t fly everywhere), and finally add the melted chocolate chips. It worked well for me. Refrigerate frosting for at least 4 hours or overnight to allow it to set before spreading on cooled cake. As a side note, I try to make treats for my family that are not only tasty, but also at least somewhat nutritious. So although this cake does have sugar and a sweet chocolate frosting, I incorporated another whole grain (barley) besides wheat, as well as coconut oil, which has some very healthful properties. If you are concerned about the powdered white sugar not being vegan, (some vegans don’t use white sugar since it is sometimes processed with bone char for whitening) I believe that organic white sugar, including organic powdered sugar, is fine. From what I understand, standards of purity for organic foods do not permit processing with bone char, so organic white sugar is bone char free.